Energy stocks appear to be suffering from a case of déjà vu. Last year, the sharp recovery in US crude production and the oil-directed rig count, coupled with money managers taking profits on their sizable long positions in Brent and West Texas Intermediate (WTI) futures, conspired to send WTI tumbling to as low as $42 per barrel. On the surface, a similar dynamic is at play today. Money managers have pared their long exposure to WTI and Brent crude oil futures in recent weeks, though these traders haven’t increased their short positions meaningfully. These dynamics suggest that hedge funds see limited upside potential for oil prices in the near term but don’t expect the bottom to fall out. Incoming US data points haven’t helped investor sentiment, instead conjuring up bad memories from 2007. Monthly estimates from the Energy Information Administration show that domestic crude and condensate production has surged since the end of August 2017, surpassing 10 million barrels per day in November. And the weekly data set indicates that domestic output may have climbed to 10.25 million barrels per day—an all-time high. 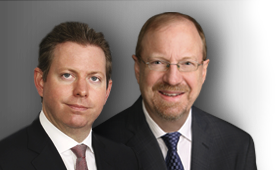 The short-cycle nature of shale development should enable US upstream operators to take share as global oil demand grows and several years of minimal capital expenditures constrain output growth in longer-cycle international markets. This intermediate-term outlook underpins our bullish view on our favorite midstream master limited partnerships (MLP), as these names should benefit from growing throughput and demand for processing and transportation capacity. 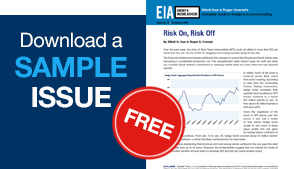 In the past, we’ve argued (correctly) that market participants and investors who bet against the resilience and potential upside in US oil production do so at their own peril. However, with the market now accustomed to these upside surprises, we’ve cautioned that investors shouldn’t overlook the potential constraints on US production growth—a risk factor that underpinned our call for WTI to spend the bulk of the year between $55 and $60 per barrel. Some of these constraints have started to emerge. First and foremost, much of the expected upsurge in US oil output hinges on everything going according to plan in the Midland and Delaware Basins, prolific plays in West Texas where midstream (pipelines and processing) and upstream (exploration and production) companies alike have sought to establish a foothold at seemingly any cost. 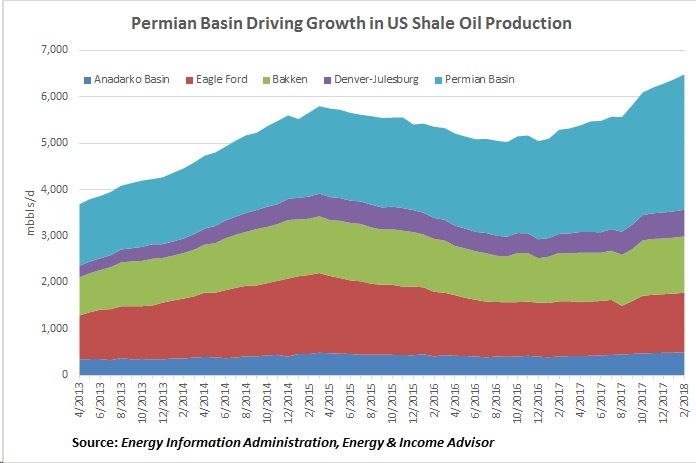 Oil output from the Permian Basin has surged over the past few years and now accounts for about 30 percent of US onshore production and about 44 percent of the crude volumes lifted from shale plays. This trend looks set to continue, with 54 percent of the US oil-directed rig count operating in the Permian Basin. 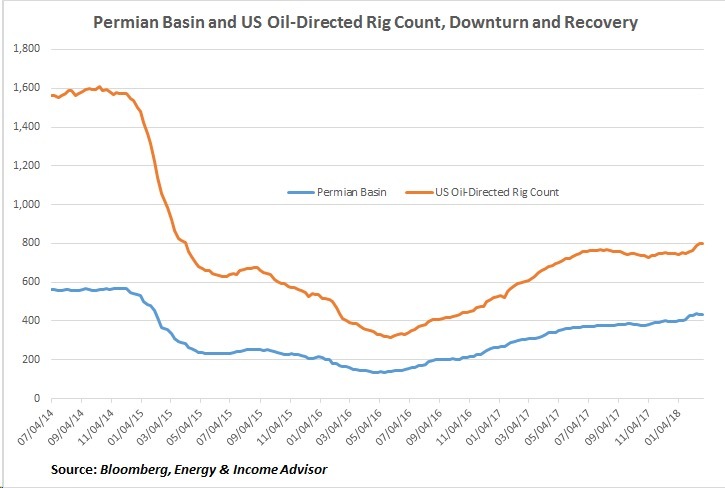 However, this concentration of activity in the Permian Basin creates logistical nightmares and can intensify cost inflation, as upstream operators compete for services, equipment, consumables and labor. In this environment, disruptions in the Permian Basin can have an outsized effect on overall completions acivity and production levels.